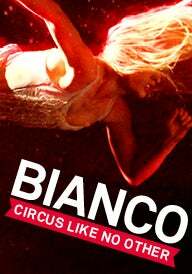 We do not curently have theatre tickets available for Bianco This could be because we have simply sold out or it could be that this show is no longer running. The information on this page remains purely for historical and informational purposes. Marvel at a dramatic live contemporary circus performance from NoFit State. BIANCO is an immersive promenade show directed by Firenza Guidi. It takes place above, behind and all around a standing audience, with a constantly evolving narrative set to a pounding soundtrack performed by a live band.